Following on from Kristi Pinderi, the first Albanian recipient of the Natalia Bracelet, Xheni Karaj an LGBT activist also from Albania is included in the Natalia Project security system, to coincide with her participation at Podgorica Pride in Montenegro, a society with widespread homophobia and conservative attitudes. The Natalia Bracelet represents an important physical, moral and psychological support to Xheni in her daily activities as an LGBT human rights activist. “Our organisation is constantly under threat. We receive everything from hate posts on Facebook to physical threats stating that our community centre will be burned down. The Natalia Bracelet goes a long way to offering peace of mind. We feel more protected with the knowledge that there are thousands of witnesses and protectors who have our back with this personal alarm system,” said Xheni Karaj. Xheni Karaj who is founder of the Albanian LGBT organisation Aleanca in Tirana attended Podgorica Pride to show her support for Montenegro’s first Pride Parade of all time. 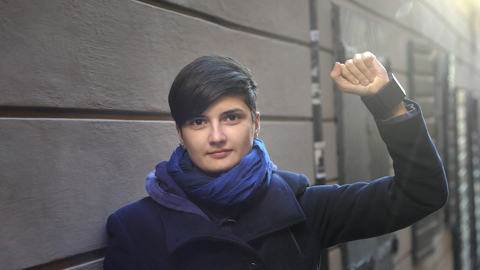 In her work as an LGBT activist Xheni is constantly exposed to threats ranging from hate speeches, harassment to being physically assaulted in public. “I was once spat at by a man on the street while at a demonstration. Albanian men get very threatened by lesbians so I challenged him. I grabbed his hand and told him I would not let go until the police arrived,” said Xheni Karaj. Her organisation envisions a free, open and equal Albania embracing diversity, inclusivity and gender equality for everyone in society. Xheni is passionately involved with capacity building, lobbying and advocacy to empower the rights of the LGBT community in her home country. The Natalia Project now sees three human rights activists in the Western Balkans equipped with this personal alarm system. The project is soon branching out to East Africa and SouthEast Asia.